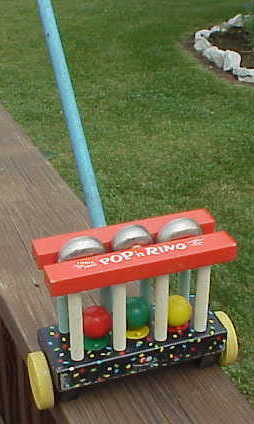 Description: The Pop 'n Ring has a wooden cage with 3 cells. Each cell has a caged wooden ball and a nickled bell above the ball. When pushed, the balls bouce up to hit the bells above them to make a merry little tune. FPT4421 - Wooden push toy with a small rectangular wooden base covered with a black paper lithographs and multi-colored confetti. The base rolls on 2 red wooden wheels and has a hole in the back to connect the removable push stick. The base has 8 upright wooden dowels, 4 white dowels across the front and 4 light blue dowels across the back, with a red rectangular wooden block across the front 4 dowels and another red rectangular wooden block across the back 4 dowels. There are 3 large nickled bells sandwiched between the two red rectangular blocks, and 3 large wooden balls sandwiched between the dowels. When pushed, the balls bounce up and strike the bells. Measures 8-1/2" wide and 23" long overall. *See "Variations" below. Patent No. 2,835,074 / 2,833,083. Canadian Patent Nos. 568,338 / 580,946. 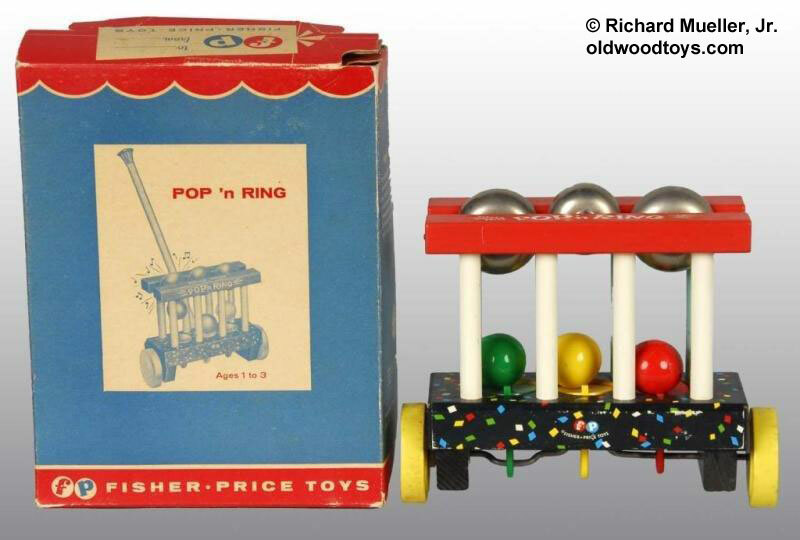 Also see 1956's #808 Pop 'n Ring.